Center for Family Strengthening (CFS) partners with family support organizations in San Luis Obispo County, known as family resource centers (FRCs), to provide resources to families in need. Over the past two decades family resource centers (FRCs) have become community fixtures and an effective means of reducing barriers to family services, delivering resources, and providing parent education. In April 2000, the California Family Resource Center Learning Circle (Learning Circle) published Vehicles for Change, Volume I. The Learning Circle was a diverse group of individuals including researchers, practitioners, policy-makers and funders. The group contributed experience and expertise to define family support as a model to prevent child abuse and neglect. The nature of an FRC is agile, evolving and unique to the community it serves. FRC staff, known as Family Advocates, work closely with schools, local government, county social services, community-based organizations and health care providers to support families. FRC services and programs build on family strengths and provide concrete support during crisis. 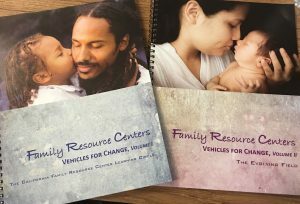 Vehicles for Change, Volume I was a seminal document that described the characteristics and activities of quality family resource centers (FRC) and became a guide to both funders and practitioners. A family resource center is a vehicle for positive change for families. Today FRC leadership continues to refine the model by implementing best practices from the family strengthening field, investing time and resources in evaluation, and engaging community stakeholders in the health of children and families. In 2017 Vehicles for Change, Volume II was published and tells the story of the evolution of Family Resource Centers (FRCs) since 2000. The publication describes the factors that have contributed to the growth and development if FRCs and how these programs have expanded into other institutions including education, libraries, health centers and childcare centers. Click here to view Vehicles for Change Volume I and Volume II. Click here to download the SLO County Family Resource Center Directory.